The 2017 model of Nissan’s luxury crossover Infiniti QX50 drew frequent comparisons to its rivals, Mercedes-Benz’s GLC and BMW’s X3. Mercedes-Benz sold 5,717 GLC vehicles in South Korea in 2018 and BMW sold 2,304 X3s -- far outpacing Nissan, which sold only 27 QX50s so soon after its launch. 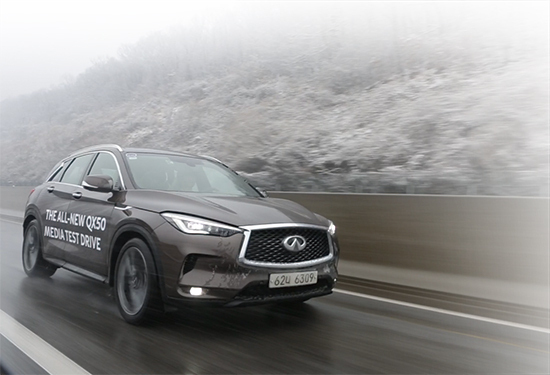 But it is too early to say that the Infiniti QX50 is lagging behind, because after a one-year hiatus the all-new QX50 is here, having undergone an impressive transformation. The new QX50 differs significantly from the original, as it is equipped with the industry’s first-ever variable-compression engine. The technology is based on a multilink system that automatically controls the range of the engine’s piston for optimized power to improve fuel economy. The test drive -- 150 kilometers from the Walkerhill Hotel in northeastern Seoul to a resort in Gapyeong, Gyeonggi Province -- was not long enough to experience every one of the vehicle’s functions, but it still allowed drivers to feel the elegance of driving such a powerful SUV even on a snowy day. The new 2.0-liter, four-cylinder VC-Turbo engine provides 272 horsepower and 38.7 kilogram-meters of torque. Infiniti said although the vehicle runs on gasoline, it has the torque and fuel efficiency of a four-cylinder diesel engine. But what was more impressive was its interior design and spaciousness. Under the concept of “powerful elegance,” the QX50 features leather and suede for its five-passenger seats. The expanded cargo area and increased leg room added to the sense of spaciousness. The price, which starts at 51.9 million won ($46,032) including VAT, makes the QX50 around 10 million won cheaper than its rivals -- an affordable option for drivers seeking a midsize crossover.